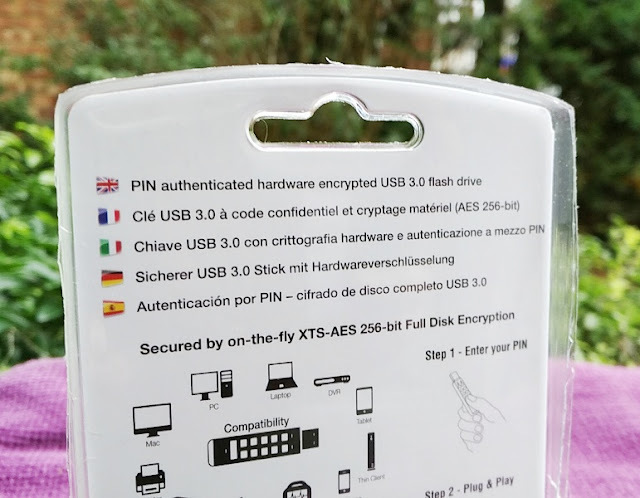 Whether is for personal files or business security, there are many reasons why you would want the sensitive data on a USB flash drive to be secure. 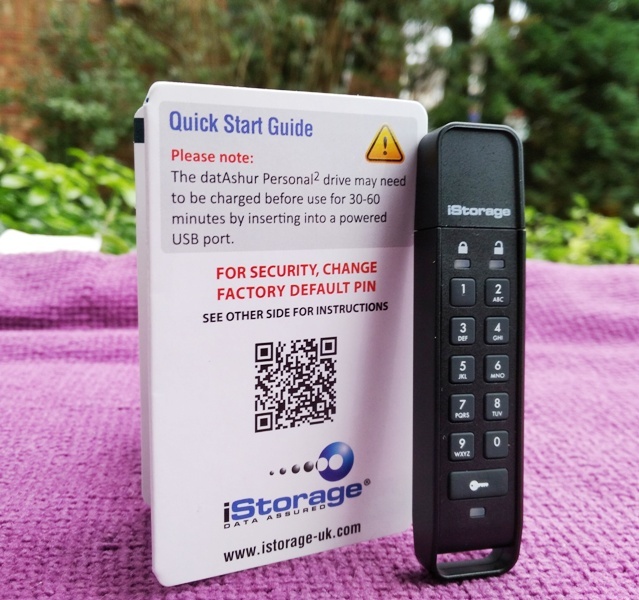 If you are in the market for a secure flash drive that works with any operating system without any software or drivers, look no further than a solution like the diskAshur 2 hard drive, datAshur PRO or datAshur Personal 2 by iStorage! 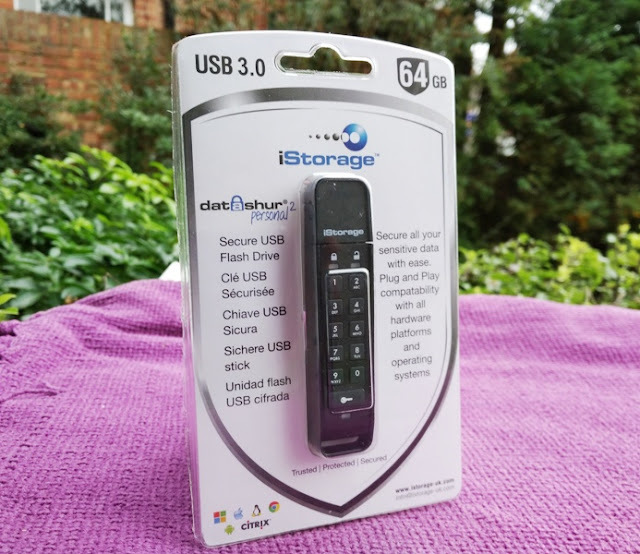 The datAshur Personal 2 is a USB 3.0 flash drive that features AES 256-bit XTS military grade hardware encryption, an on-board rechargeable battery (charges full in 1 hour), three LEDs, a key button and a 10-digit alphanumeric keypad for entering a 7 to 15 digit PIN before gaining access to the data on the drive. The two LEDs on top light up red (lock) and green (unlock). The key button is used to activate the flash drive and to enter PIN codes. The blue LED on the bottom indicates activity of the flash drive. 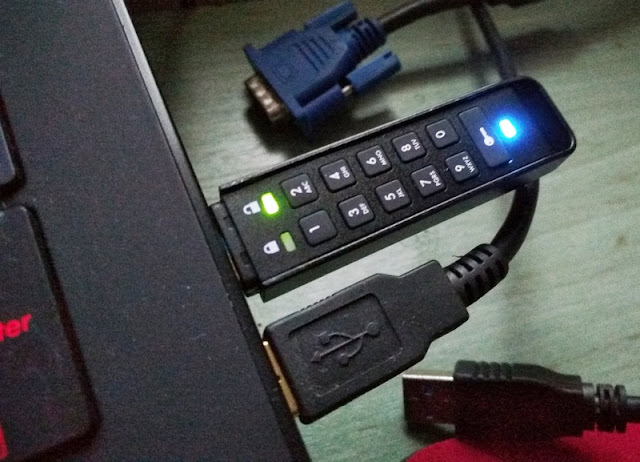 When the LED lights up solid blue, it means the flash drive is connected to the computer. When the LED flashes blue, it means data is being transferred. The datAshur Personal 2 flash drive comes preset with a default user PIN (1-1-2-2-3-3-4-4), which you easily change via the kepad. The user PIN requirements include entering a PIN between 7 and 15 digits long without repetitive nor consecutive number patterns. The datAshur Personal 2 flash drive works by first unlocking the drive and then inserting in the USB port. While inserted in the USB port, you cannot change the user PIN nor unlock the drive. With that said, should the built-in battery in the flash drive run flat, you can unlock the flash drive by inserting it in the USB port. 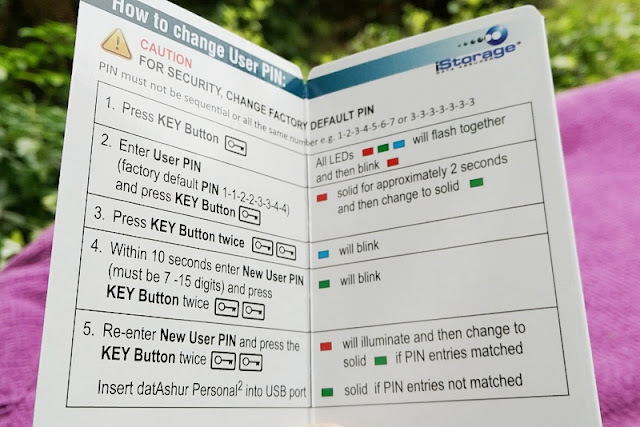 Also, if you make a mistake when entering a new user PIN or abort the "new-pin entry process", the datAshur Personal 2 flash drive will keep your old PIN. After changing the user PIN, you then create an Admin PIN with the same PIN requirements as the user PIN. After both user and admin pins are set, you now have two ways to access the datAshur Personal 2 flash drive so you can give someone else "read-only user access" while you keep admin access. As the admin of the flash drive, you can reset the user PIN and disable and enable "write protect" on the flash drive. To enter admin mode, you need to press the key button twice and then enter the admin password and press the key button once. To enter user mode, you press the key button once, enter the user password and then press the key button once. 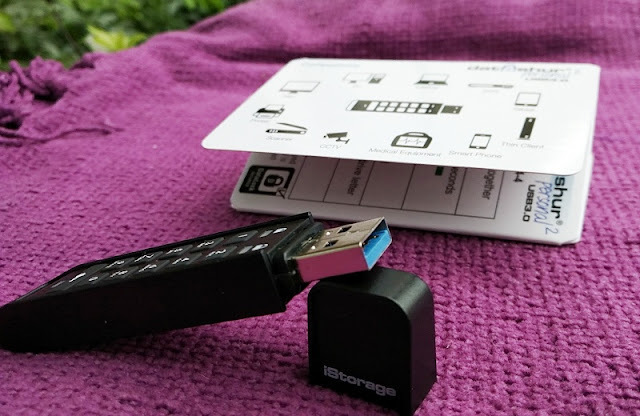 All the data transferred to the datAshur Personal 2 secure flash drive is encrypted in real time thanks to 100% hardware encryption and SHA 2 algorithm with SHA256 hash function which generates an almost-unique 256-bit (32-byte) signature of text data contained in the flash drive. The flash drive automatically locks itself when unplugging it from the USB port. The dataAshur Personal 2 USB stick also features a Timeout Lock feature that allows you to manually set to any time you want. 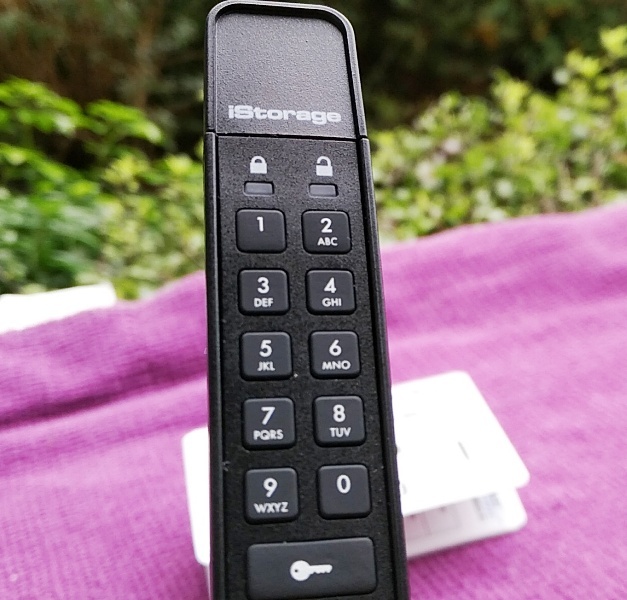 The datAshur Personal 2 also has a few other safety features such as Read-Only Write Protection so data cannot be written to the flash drive, as well as defensive hacking against brute force attacks so you won't have to worry about someone trying to crack your password. When the datAshur Personal 2 flash drive detects a hacking attempt (10 unsuccessful attempts to unlock) both the user PIN and admin PIN (a.k.a. cryptographic parameters) will be zeroed. This means that the PINs will reset and the data will be erased from the flash drive. You will need to then create new user and admin PINs and format the flash drive. There is also a way to reset the datAshur Personal drive in case you forget the PINs. Resetting the flash drive also allows you to make the flash drive writable again. The datAshur Personal 2 AES 256 bit flash drive has read and write speeds of 139 MB/s read and 43 MB/s write when inserted in a USB 3.0 port. Transferring a one gigabyte movie to the dataAshur Personal 2 stick takes only seconds. 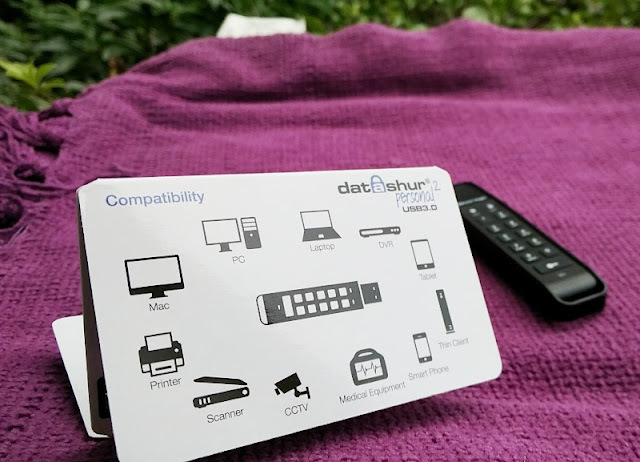 datAshur Personal 2 works with Windows, MAC, Linux, Thin Clients, Android & Embedded Systems.